The Arboretum Explorer Camp is the perfect place for budding naturalists, animal lovers, and young outdoor enthusiasts. Join us on the beautiful grounds of the Edith J. Carrier Arboretum as we learn about the life cycles of trees and butterflies, explore animals’ behavioral adaptations like camouflage and mimicry, and get up close and personal with salamanders, turtles, and birds. Activities include hands-on lessons, team scavenger hunts, and new for 2019, a field trip to an off site hiking location for a group hike. Learn how to pitch a tent, cook food on trail and navigate with a map. 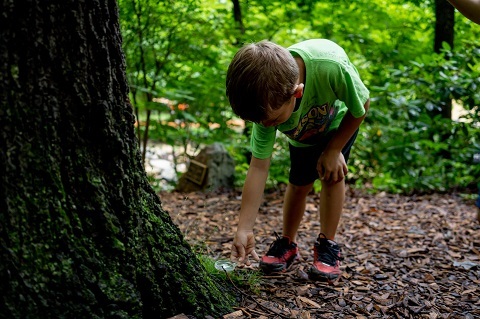 Campers will make new friends, encounter plants and animals, and gain new skills of wildlife observation and identification in the Arboretum’s oak-hickory forest ecosystem! Instructors include Arboretum staff, JMU professors and students, as well as local Master Naturalists. New for 2019, camp will be a full day program! Both camps meet Monday - Friday from 9:00 a.m. - 4:00 p.m.
Bring your own packed lunch Monday- Thursday, lunch will be provided on Friday. What happens at Arboretum Camp?